Jackie Dalton, co-executive director of REM, and John Dalton, president and CEO of Inland Hospital, were recognized for eight years of volunteer work in the Waterville area. When Jackie and John Dalton go out for date night, it’s often at a fundraiser or supporting a community event. It started eight years ago when they joined Waterville Rotary, and since then the couple has become more involved in community service. 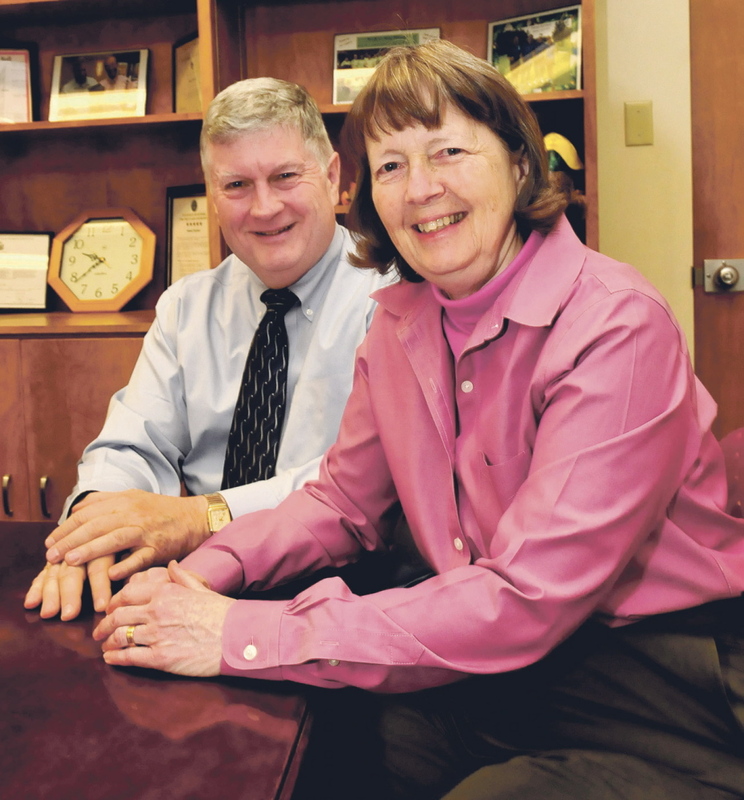 This year, the well-known husband and wife will be given the Distinguished Community Service award from the Mid-Maine Chamber of Commerce after receiving an outpouring of recommendations from residents. The awards banquet is scheduled for April 29 at the Elks banquet hall in Waterville. “It’s been a very humbling experience,” said John Dalton, president and CEO of Inland Hospital in Waterville. The couple, married nearly 41 years, said that service was part of getting connected to the community when they moved to the area in 2006. They had become empty-nesters after the graduation of their daughter, and John said they wanted to use their new free time to get more involved in the community. “Everyone first said get involved with the Rotary, and we went from there,” John said. Before moving to Waterville, they coached soccer and helped out with Boy and Girl Scout troops for their children, Andy and Abby, who now both live in Massachusetts with their families. John Dalton is now vice chairman of the Kennebec Valley Community College foundation board, chairman of the Central Maine Growth Council Board and a member of the Waterville Opera House board and the Waterville Development Corp.
John Dalton said being involved in the community also includes donating to Waterville area groups such as Hardy Girls Healthy Women, the Mid-Maine Homeless Shelter, Alfond Youth Center, Family Violence Project and United Way of Mid Maine. “Sometimes it means writing a check. Sometimes it means going to an event. Sometimes it means joining a board,” he said. Jackie Dalton’s primary focus is volunteering as co-executive director of the Waterville-based REM, which works to help start nonprofits and organize volunteering in the community. She is also secretary of the Kennebec Messalonskee Trails board of directors, a member of the Waterville Main Street board and a past president of Friends of the Maine Children’s Home for Little Wanderers. Jackie said she has stayed out of the spotlight primarily, and one of her favorite activities is an REM awards night to spotlight the work of others. She said she loves giving time to do the behind-the-scenes work and organizing that it takes to run the efforts. John Dalton joked that the real reason he was nominated was because of Jackie and her many volunteer hours.